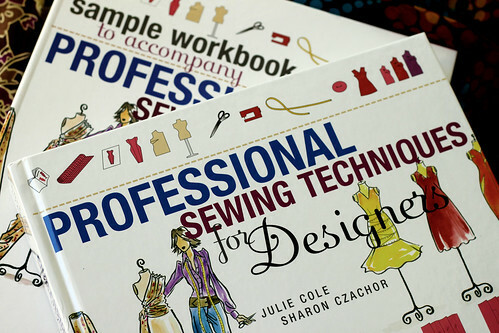 These are the sewing books I saw on the “Threads” Magazine blog. They are college textbooks for aspiring fashion designers. Alex wants to learn to sew and I thought having some kind of book as a guide would be better than the learn by project approach, that I am teaching at Joann’s. Also I am going to make up the samples to have on hand for my students. I think having samples will make explaining things easier. I am not sure Alex will take to sewing. He jumps around from one thing to the next faster than I do. As for my first impressions of the books, I think they are wonderful. The sewing guidelines are more for industry sewing than home sewing. So I will have to adjust some of the little things to make them work with the commercial home sewing patterns my students use. I am especially looking forward to trying the techniques in the section on stabilizing fabrics. That is my weakest area of expertise. The books are not inexpensive. On first looking through them, I think they are worth the price. This entry was posted on Sunday, September 6th, 2009 at 3:00 am and is filed under Sewing. Tagged: Sewing. You can feed this entry. You can leave a response, or trackback from your own site.